Latest news about the tour: See separate 1997 and 1998 tour dates, and the reviews pages. Dec. 31: Happy New Year! Thanks to everyone for a wonderful 1997. All the best wishes to all Stones fans for another great Stones year in 1998. And yes, on purpose I haven't pushed any news on you for the past days - we all need to rest at times - but tomorrow it's another year, with many great Stones news coming up! After the final 1997 show in St. Louis on Dec. 12, there haven't been much Stones activity. Mick flew directly to London, and he went straight from Heathrow to the hospital on Saturday, the day after the concert, to see his wife Jerry and their newborn son. Mick was smiling and seemed to be very, very happy. Charlie went shopping in New York with his family. It seems like they are enjoying their Christmas break. And now, to all of you Stones fans out there, take a break from the concert travel, ticket chasing, and enjoy Christmas! Merry Christmas to you all! The Stones may close the North American Bridges To Babylon tour with a 1,400 capacity club show at the Hard Rock in Las Vegas, before they leave for the rest of the world. The date is Feb. 15, see the IORR tour dates and an insert in Wall of Sound. Ticket sales may be like at Brixton and Olympia in Europe in 1995 (see IORR 23 and IORR 24 about how ticket sales were organized back then. More details in IORR 31. The Rolling Stones concert in Mexico City on Feb. 7 has been confirmed. Ticket sales will start at local Ticketmaster offices on Monday Dec. 15. The Stones concerts in Demnark, Finland and Sweden sold about 40,000 of the approx. 50,000 tickets in each country on the first day of sales. Still some few field tickets left. Oslo, Norway is announced by the Stones in press releases, but still not on sale. Wembley Aug. 20 is still on sale, no sign of the 2nd day Aug. 22 on sale yet. Tallinn, Estonia confirmed in local press. If you have info about ticket sales in your home country then please tell us! Thanks! Jerry Hall gave birth to her and Mick Jagger's son today in London, to be named Gabriel Luke Beauregard Jagger, weight 3,700 gram. This is Mick's 6th child; as he has 4 with Jerry and two from the past. This is one of the most talked about births re. the Stones', as the MSG shows in NY planned for December was moved to January, partly due to this birth. Now Mick will perform with the Stones in Atlanta tonight (please give him a big congratulations), then the final St. Louis show on the 12th, before he gets to met Jerry and his newborn son. The World Championship football game Scotland vs. Norway, to be played at 4:30 pm local time, on the same day as the Stones play Edinburgh, Scotland, on June 16, 1998, will be shown live on the video monitor of the Bridges To Babylon stage. So you will get two shows in one - no reason for staying home that day if you are a football fan. You don't need to go to MSG and New York to see the Stones in a smaller venue. Quebec is less than 20,000, but sold out. However, the Houston shows go on sale tomorrow, Saturday, and even now you can still buy Sprint tickets if you call right away, see the IORR how to get tickets page. The Houston capacity is just 14,000... Houston will be the last show before they ship the Babylon stage to Japan (except the rumoured Hard Rock "small" show in Las Vegas...). The new 360 degrees stage setup design is making available more tickets "behind" the stage, and tickets are being put on sale for the Rose Garden in Portland this Saturday, December 6th, at the Rose Quarter Ticket Office and all Ticketmaster locations including Meier and Frank and G.I. Joe's or by phone at (503) 224-4400. There will be a four (4) ticket maximum per customer. If you want to see the Rolling Stones next summer on home ground in UK, then check out the special offer made for Stones fans by Badlands, but don't delay, as the supply of tickets and hotel rooms will be limited. Today at 7pm it all happened, on the Stade Velodrome, Marseilles, France. The groups and dates of the first round of the football World Cup 98 in France June/July was drawn, and you all know by now if they fit nicely into your Rolling Stones concert schedule for the summer of 1998. The biggest problem for the Stones is the Edinburgh concert on June 16, going on sale today, the same day they are drawn to play WC on June 16 vs. Norway, at 17:30 (4:30 pm local time). Be sure the Stones go on stage very, very late, so that the Scottish fans don't miss their game. Hopefully the ticket sales won't have a big setback tomorrow, when the full scale ticket sales are on in Scotland. The Belgium vs. Mexico game is on June 20 at 14:30, same day as the Stones play Werchter, but finishing long time before the Stones go on stage. And on July 22, 10 days after the World Cup is over, the same stadium de Velodrome in Marseilles will host the Rolling Stones in concert! The Rolling Stones will play Murrayfield (rugby stadium), Scotland on June 16, and Wembley Stadium, London, England on August 20. These shows are confirmed, and go on sale tomorrow, Friday 5th. For ticket prices see the 1998 tour dates page. Watch out for an additional Wembley show on Aug. 22, and an optional unconfirmed show in Leeds on June 18. PS. Wembley will not be closed until after these shows, so don't worry about the "Wembley being closed" rumours. UK travel offer: IORR is cooperating with UK partners to do a hotel + concert ticket package offer for Stones fans anywhere in the world. This package will be on display here later today. Please be patient, as individual enquiries can't be handled until this offer is being published here. The Stones concerts in Copenhagen, Denmark (July 29) and Gothenburg, Sweden (July 31) are now confirmed, and go on sale on Monday Dec. 8. This makes a perfect Nordic summer holiday for Stones fans by car (or train) (plus ferries), as you can follow a scenic route through Copenhagen, Gothenburg, Oslo (unconfirmed), Helsinki and Tallin (unconfirmed), making 5 countries and shows in 11 days. Recommended! As the Stones were running into the final set of their concert at the Silverdome in Detroit, shortly after 11pm, a fan dancing on a handrail slipped and fell from the 2nd into the 1st level concret floor, and died half an hour later. See details in the Detroit Silverdome reviews pages. The Helsinki, Finland concert is confirmed to be on August 5, 1998. Tickets go on sale on Monday the 8th of December. For more info including phone and web access see the 1998 tour dates list. PS. UK dates including Wembley are said to be made official tomorrow Thursday 4th. Stay tuned! The Mick Jagger chat on American Online (AOL) last night can be seen on the official Chat with Mick web pages of Virgin. Mick talks about the concerts in Los Angeles and New York, saying they are tough, because the first night there the audience behaves as if its the first night of the tour, whether it is or not. Also, his favourite track off Bridges To Babylon (at the moment) is Saint Of Me -- because it works well live too, I guess. The Rolling Stones are confirming their concerts in Spain (Barcelona), France (Lyon, Paris, Marseille), and a final leg of the European Tour 1998 in Turkey (Istanbul) and Greece (Athens). See confimed dates in the 1998 tour dates list, and expect more dates to be confirmed soon. As 4 shows and 200,000 tickets sold out in three hours (that is 1000+ tickets per minute! ), Amsterdam is getting a 5th show on July 6th 1998, to go on sale this Saturday Dec. 6. Ticketmaster is confirming the 16,000 capacity Stones show at the Compaq Center (the Summit) in Houston, TX on Feb. 12, with an optional 2nd show on the 13th. Tickets go on sale Monday morning Dec. 1st at 8am through Sprint, and Dec. 6 at 8am through Ticketmaster. As the dust is settling from the initial ticket sales of the Dutch shows, it is now confirmed that the 4 shows on June 29 and July 1,2,5 are sold out. A total of 200,000 tickets sold out in few hours... Expect more shows for Amsterdam, as Holland seems to have a hugh appetite for the Stones! Warmup artist for the Pay Per View show at St. Louis on Dec. 12 will be Kenny Wayne Shepherd. Tickets to Stones concerts in Belgium, Germany and The Netherlands are on sale now, both through telephone and web. See the 1998 tour dates list for phone numbers, web addresses and prices. This web page will be updated with a lot more details about the prices, open seating arrangements etc in a day or so. Amsterdam will probably get 5 dates or more in total, and Belgium may get a 2nd date. 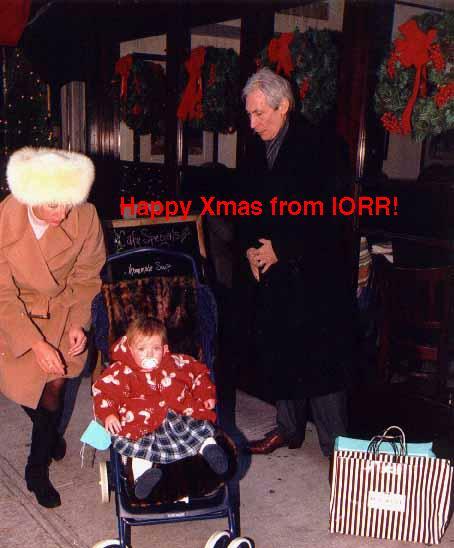 If you spot errors or have additional info, then please send email to iorr. Nov. 26: Werchter, Belgium on sale! The Stones concert at the Werchter Festival Site outside Brussels in Belgium on June 20 has been confirmed and is now on sale. The Dutch promotor MOJO is confirming the Rolling Stones concert on June 29, ticket sales starting in Holland on Saturday Nov. 29 at 9am CET (Euro-time). The venue is Amsterdam Arena (a.k.a. Ajax Stadium). Expect about 3 more shows to show up as tickets are going fast - see the 1998 tour dates. Info about where to call, how to get tickets etc will come here soon. PS. German shows will go on sale too on Saturday - the tour announcement will be any day this week. Nov. 21: Houston arena shows? The two shows planned for Houston Feb. 12 and 13 may actually be arena shows at the 16,000 capacity basket ball venue Compaq Center a.k.a. The Summit. See article in the Houston Chronicle. We all feel sorry for the Quebec fans, who have been shuffeled around two times, due to Charlotte and MSG changes. But in the end, they get an exotic show. The entire concert will be played from a small center stage. Isn't that what we all dream about these days??? The 4th and final Oakland show brought some surprises, including Rock And A Hard Place back in the set, Waiting On A Friend as the web choice, and most important, Keith changed his standard song "I Wanna Hold You" into You Don't Have To Mean It! So now it is 5 songs from the new album in the shows, that is if Keith plays it again... See the complete Oakland 19th setlist for details. Nov. 20: MSG Jan 14,16,17 confirmed! As you could read about here a few days ago, the Madison Square Garden concerts in New York, January 1998 are now finally confirmed by the Stones, Ticketmaster and Sprint! The MSG is centrally located on Manhattan, NY, a medium size arena used for ice hockey, plenty of great concerts, and now the Stones, again! Capacity about 18,000 people, all excellent seating. They will start selling the Jan 14 show, then move on with Jan 16, then Jan 17. Tickets go on sale through Ticketmaster Monday Nov. 24 at 9am est. Presales through Sprint (very limited number of tickets!) from Nov 20 (today!) until Nov. 23, starting 7am cst. Ticket prices will be $300, $150, $85, $50, $30. This will be the major Stones event of the American tour, for sure. See more details, who is going etc. on Shoiley's page! The tour dates in Germany and Holland will be announced on Nov. 24 at the latest, and ticket sales will start Nov. 29. Japan will go on sale Dec. 14. The list of 1998 tour dates is currently being revised (London is wrong, Germany is changing in Aug), and a new 3rd generation list will be posted later today. The next single Saint Of Me has been delayed until January 12, 1998 (release date for Europe). The Madison Square Garden shows will probably be on Jan. 14, 16 and 17. The Quebec show is moved yet another time, to Jan 5. Don't know about the 2nd Quebec... Houston is in, and Mexico City changed. Hard Rock Las Vegas seems to be on Feb. 15. See complete list of all the changes in the American Tour dates list. See the 2nd generation list of 1998 world tour dates. A lot of the European tour dates seems to be final, like 5 shows in Amsterdam, 4 in Scandinavia, 6 in UK, and many German dates. Australia is still missing from the list, too bad, but the Far East is in, plus 7 shows minimum in Japan, plus South America, getting more shows as ticket sales start moving. The tour dates may be announced officially next week, on Monday, or worst case by Dec. 12. The Rolling Stones stayed in Los Angeles after having finished their two LA shows, to record the new Saint Of Me video, which was finished on Wednesday. The day after they went to San Francisco, to play four shows in a row at Oakland Coliseum, just across the San Francisco bay, the home ground of the Oakland Raiders. See the extensive new list of rumoured 1998 tour dates. Also, some changes of the Jan. 1998 tour dates. Finally, many new reviews have been added to the reviews pages. During the break in touring last week, the Stones stayed in Laguna Beach, California, resting and rehearsing. See interview with Ronnie Wood in Arizona Central. Also, see the Phoenix review, including great photos! Nov. 11: Dodger Stadium rocked! The last Rolling Stones concert this year on Dec. 12 in St. Louis will be the Pay Per View show of the North American tour, i.e. the show they will broadcast completely on TV and radio. In 1994 the Miami show was Pay Per View show, with special guest artists. See article in Billboard. Nov. 10: IORR is back! The IORR web site has been running non-stop night and days since the new server was in place for Chicago Sept. 18, but this week-end a providor networking error took it down for a day or so. Sorry! But now we are back!!! The reason for the huge backstage fire during Tumbling Dice in Phoenix, Nov. 7, was one of the red lights, burning all through Sympathy For The Devil. So it seems, this song again calls upon bad luck... The fire brigade must have been inside the stadium, or very close, because the fire was killed in less than 10 minutes, before Tumbling Dice finished. In Los Angeles, Mick's left side "baby" (i.e. the golden inflatable woman with fruit covering strategic places) was gone, so may be she went with the fire? For today, 2nd show, it is pouring rain in Los Angeles, so no big danger for another fire. Nov. 10: More reviews wanted!!! Please send your review and personal opinion about the concert you have seen. All reviews will be posted on the reviews pages. While travelling, it is hard to do major web updates (like now...), so some reviews may slip unintentionally. The faster you post, the better. IORR is an ideal not for profit fan club, so I can't offer reviewers backstage passes or money, but you will be rewarded in Stones heaven... And, to be honest, some of you faithfull revieweres will get some great surprise gifts from the large selection of IORR goodies (rare items, photos, books etc). So don't delay - send your review now! Thanks! I had always dreamt of seeing the Stones at the famous Sun Devil Stadium, as shown in the Let's Spend The Night Together movie, flying over the hill and the stadium. Well, Phoenix was hot, in fact so hot that the fire brigade had to shut down a fire behind the stage, inside the venue, during Tumbling Dice! They made a debut of Saint Of Me, and Star Star was again the web choice voted into the internet. See the Phoenix review. The Syracuse Jan 16 show has been re-scheduled to Jan 7, probably due to changes in order to fit in some shows in Madison Square Garden. Bill German, editor and publisher of the famous New York based Beggars Banquet Stones fanzine for 17 years, will do a lecture in San Francisco on Thursday Nov. 13. He will talk about his years as publisher and insider with the Stones. The lecture is being held at the San Francisco Art Exchange, 458 Geary St., SF, few blocks away from Union Square. Space is limited, so make your booking now, phone 800-344-9633, or email to SF Art Ex., or if you are an IORR member, email IORR as soon as possible to meet up in San Francisco, and to be guaranteed entrance. In the same locations they are exhibiting the world's largest collections of Ronnie Wood art. Bill German is close friend with Ronnie Wood, and in 1994 Ronnie actually partied at SF Art Ex., but don't expect him to be there now, even if you have been warned! The new Rolling Stones single Saint Of Me is due to be releasen in Europe on Dec. 1, but it may be delayed one week to the following Monday, Dec. 8. Logistics of the cover, video, release etc... The radio station air play date will be Nov. 17 or 24, i.e. two weeks before it is being released. Still no news if this single will be released in USA. Nov. 5: New World Tour dates!!! The dates for the rest of the Bridges To Babylon tour are now available from the Bridges To Babylon Virgin tour site. A lot of very, very exotic stops, including Reykjavik on Aug. 2, Dubai May 17. Also, interesting places includes Edinburg (Scotland) , Birmingham (England), Kuala Lumpur, Singapore, Bankok, Manila, and ending with two shows in Hong Kong Sept. 22, 23. There will be more dates, but already, there are plenty of dates in Europe, South America, Japan and the rest of Asia. PS! These dates are not 100% official, and it seems like they are not 100% up to date. Please follow this site in the days to come for exact dates and locations! Nov. 4: St. Louis broadcast Dec. 12? The last official show before Xmas, in St. Louis on Dec. 12, is said to be the pay Per View TV broadcast show in USA. Anybody able to confirm this 100% ??? The Ft. Worth, Texas show on Nov. 1 must have been some experience, as no other shows so far have produced so many stories and reviews, see the Ft. Worth reviews. Some fans were lucky to get inside the huge barb wire fence, while others felt like the rat in a cage, locked out from the concert. To see the daily news before Nov. 1, 1997, check out the IORR Aug. 97 and IORR Sept.- Oct. 97 files of "old" news. IORR 30 - Due out in Oct.